Writers are told again and again “show don’t tell” and that’s exactly what artists throughout the ages have been doing and what photographers still do. But sometimes images can be so intensely disturbing, that we long for someone, a voice of reason, to accompany us on our journey into the disturbing, chaotic world depicted. That’s exactly why I highly recommend the 1543 tapestry cartoons currently on exhibition in the Museum of Art History in Vienna but you must also get the audio tour along with it. 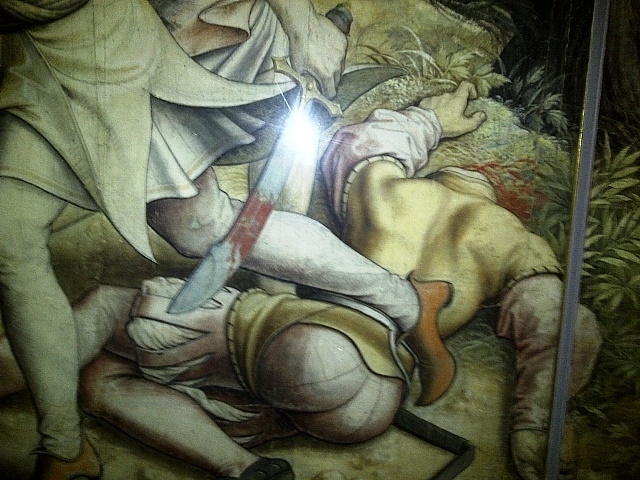 Vermeyen’s graphic depiction of a beheaded corpse and bloodied sword. In 1535 court painter, Flemish artist Jan Cornelisz Vermeyen, was thrust into battle as part of Emperor Charles V’s campaign to reconquer the Kingdom of Tunis from the Ottomans. Eleven years later Vermeyen completed his larger-than-life 10 tiled tapestry cartoons (pronounced in the French manner with a nasal silence at the end, not like Bugs Bunny’s cartoon). These can (and should) be viewed today, 473 years later (!) (until March 2015) on the top floor (2) of the Vienna Museum of Art History (Kunsthistorisches Museum). 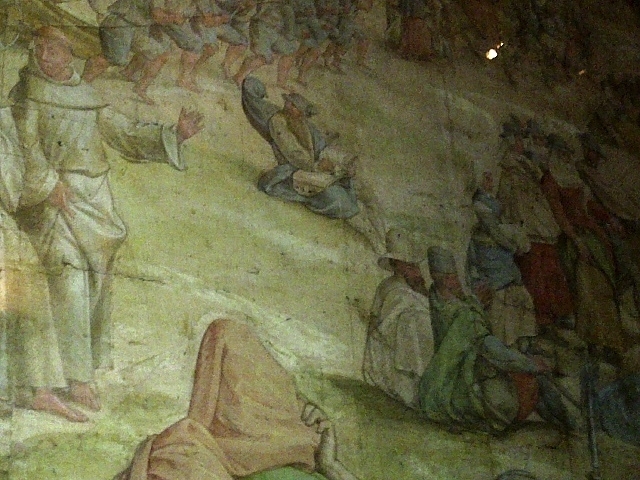 Vermeyen shows soldiers collecting heads of the enemy in battle. objector and you should be too. Here’s the thing. I am the proud owner of a Vienna Museum Annual Pass, which I purchased in an elated frenzy one afternoon convinced I would be spending every other day touring the museums in lunch breaks, weekend outings, what have you. Well, I’m not. But you still can’t beat 7 museums all year for a mere 34 € AND audio guides for a mere 2 €. So I tried out the audio guide one afternoon (peer pressured). And I was not disappointed. In fact, I immediately started scribbling Ramsay’s profound observations into my pink moleskin just so I could share them with you. Description of Benny Nemerofsky Ramsay’s “Mille Regretz” audio tour of Flemish artist, Jan Cornelisz Vermeyen’s Tapestry Cartoons of “Emperor Charles V Conquers Tunis” from 1543. “Is it possible to truly know a work of art without knowing the historical factors that influenced its creation?” (like a big ol emperor ordering you to do so). And other statements like, “While these cartoons sought to immortalize a moment in time for all eternity, the cultural and political context in which they were created is not eternal.” He’s telling us the obvious but wow! Is all art always temporary? How’s that for a bite to chew while tanking up a little culture for an hour on a Saturday afternoon? Vermeyen’s paintings show every possible act of a people at war – from the most horrific to the most banal activities, all the more riveting for their starkly contrasting realities. 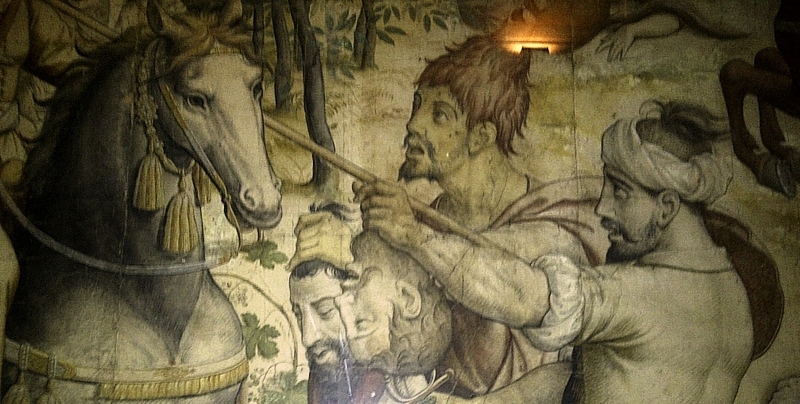 Ramsay’s audio tour will help you put the larger-than-life depictions into perspective. Want to impress a date? Go do the tour with the audio guide. Then just so happen to stop by the museum with your date, impress upon Date the uselessness of audio guides, and then take Date to the Vermeyen tapestry cartoons and spew forth all the profound, contemplative thoughts you heard. Show you’re a sensitive guy (or girl) who noticed the details of the paintings. I guarantee you, Date will be impressed. Very impressed. And if Date’s not? Red flag. Jan Cornelisz Vermeyen — court painter of Emperor Charles V and artist of the tapestry cartoons painted himself in to piece — pictured here sketching in his book in the middle of the battleground. But Ramsay does fail to pose one question that I kept asking myself. What if these were from today? Ten larger than life tiles with photos of a war photographer on the front line? You can see in the images I have included here — one of the artist, who discreetly placed himself in the middle of painting. I challenge you to find him without the audio guide. It took me a good five minutes with the audio guide. But there he is. Sketching away. The battle rages on. And I have to think of all those war photographers out there who aren’t sitting so contently in the midst of their motifs. And I have to admire what they do. And wonder if a photographer did do such an exhibition, what would we think of it today? And if someone 500 years from now would perhaps view it, would they wonder about humankind the same kind of things Vermeyen contemplated while painting, the tapestry makers thought while weaving and I thought lost for an hour in the Vienna National Museum of Art this past Saturday afternoon? 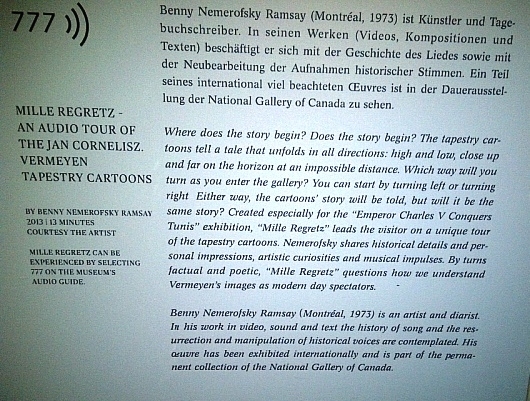 Website of Canadian Artist and Diarist Benny Ramsay Nemerofsky.